Tanna of the second century; supposed author of the Zohar; born in Galilee; died, according to tradition, at Meron, on the 18th of Iyyar (= Lag be-'Omer). In the Baraita, Midrash, and Gemara his name occurs either as Simeon or as Simeon ben Yoḥai, but in the Mishnah, with the exception of Ḥag. i. 7, he is always quoted as R. Simeon. He was one of the principal pupils of Akiba, under whom he studied thirteen years at Bene-Beraḳ (Lev. R. xxi. 7 et al.). It would seem, from Ber. 28a, that Simeon had previously studied at Jabneh, under Gamaliel II. and Joshua b. Hananiah, and that he was the cause of the quarrel that broke out between these two chiefs. But considering that about forty-five years later, when Akiba was thrown into prison, Simeon's father was still alive (see below), and that Simeon insisted upon Akiba's teaching him even in prison, Frankel ("Darke ha-Mishnah," p. 168) thinks Ber. 28a is spurious. Simeon's acuteness was tested and recognized by Akiba when he first came to him; of all his pupils Akiba ordained only Meïr and Simeon. Conscious of his own merit, Simeon felt hurt at being ranked after Meïr, and Akiba was compelled to soothe him with soft words (Yer. Ter. 46b; Yer. Sanh. i. 19a). During Akiba's lifetime Simeon was found occasionally at Sidon, where he seems to have shown great independence in his halakic decisions. The following incident of Simeon's stay at Sidon, illustrating both his wit and his piety, may be mentioned: A man and his wife, who, though they had been married ten years, had no children, appeared before Simeon at Sidon to secure a divorce. Observing that they loved each other, and not being able to refuse a request which was in agreement with rabbinical law, Simeon told them that as their wedding was marked by a feast they should mark their separation in the same way. The result was that both changed their minds, and, owing to Simeon's prayer, God granted them a child (Pesiḳ. xxii. 147a; Cant. R. i. 4). Simeon often returned to Akiba, and once he conveyed a message to him from his fellow pupil Ḥanina ben Ḥakinai (Niddah 52b; Tosef., Niddah, vi. 6). Simeon's love for his great teacher was profound. When Akiba was thrown into prison by Hadrian, Simeon, probably through the influence of his father, who was in favor at the court of Rome, found a way to enter the prison. He still insisted upon Akiba's teaching him, and when the latter refused, Simeon jestingly threatened to tell his father, Yoḥai, who would cause Akiba to be punished more severely(Pes. 112a). After Akiba's death Simeon was again ordained, with four other pupils of Akiba's, by Judah b. Baba (Sanh. 14a). Tiberias had been built by Herod Antipas on a site where there were many tombs (Josephus, "Ant." xviii. 2, § 3), the exact locations of which had been lost. The town therefore had been regarded as unclean. Resolving to remove the cause of the uncleanness, Simeon planted lupines in all suspected places; wherever they did not take root he knew that a tomb was underneath. The bodies were then exhumed and removed, and the town pronounced clean. To annoy and discredit Simeon, a certain Samaritan secretly replaced one of the bodies. But Simeon learned through the power of the Holy Spirit what the Samaritan had done, and said, "Let what is above go down, and what is below come up." The Samaritan was entombed; and a schoolmaster of Magdala (but comp. Buber, note 180, to Pesiḳ. x. 90a), who mocked Simeon for his declaration, was turned into a heap of bones. According to the version, in Shab. l.c., Simeon and Eleazar hid in a cavern, whereupon a carob-tree and a spring miraculously appeared there. In order to spare their garments they sat naked in the sand, in consequence of which their skin became covered with scabs. At the end of twelve years the prophet Elijah announced to them the death of the emperor, and the consequent annulment of the sentence of death against them. When they came forth Simeon observed people occupied with agricultural pursuits to the neglect of the Torah, and, being angered thereby, smote them by his glances. A bat ḳol then ordered him to return to the cavern, where he and Eleazar remained twelve months longer, at the end of which time they were ordered by a bat ḳol to come forth. When they did so, Simeon was met by his son-in-law Phinehas b. Jair (comp., however, Zacuto, "Yuḥasin," ed. Filipowski, p. 46), who wept at seeing him in such a miserable state. But Simeon told him that he ought to rejoice, for during the thirteen years' stay in the cavern his knowledge of the Torah had been much increased. Simeon then, in gratitude for the miracle that had been wrought for him, undertook the purification of Tiberias. He threw some lupines into the ground, whereupon the bodies came to the surface at various places, which were then marked as tombs. 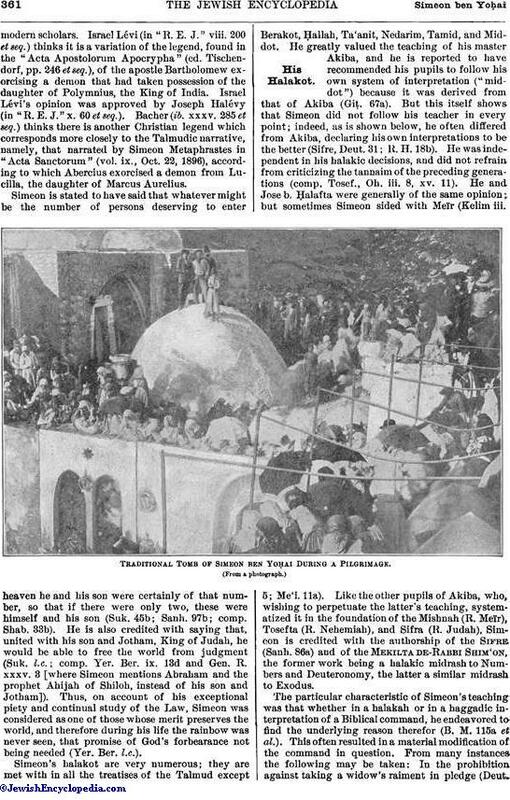 Not only was the man who mocked at Simeon's announcement of the purification of Tiberias turned into a heap of bones, but also Simeon's pupil and delator, Judah b. Gerim. It appears that Simeon settled afterward at Meron, the valley in front of which place was filled, at Simeon's command, with gold dinars (Tan., Peḳude, 7; Ex. R. lii. 3; comp. Yer. Ber. ix. 13d; Pesiḳ. x. 87b; Gen. R. xxxv. 2). On the other hand, it is said that Simeon established a flourishing school at Tekoa, among the pupils of which was Judah I. (Tosef., 'Er. viii. [v.] 6; Shab. 147b). 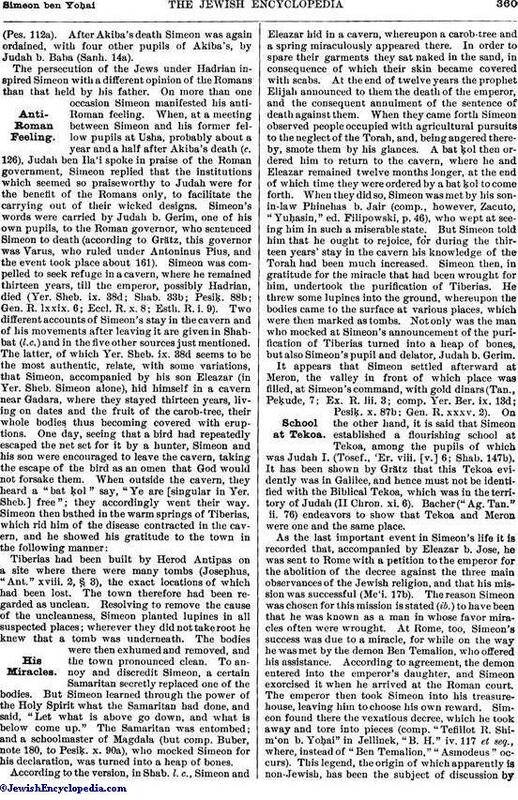 It has been shown by Grätz that this Tekoa evidently was in Galilee, and hence must not be identified with the Biblical Tekoa, which was in the territory of Judah (II Chron. xi. 6). Bacher ("Ag. Tan." ii. 76) endeavors to show that Tekoa and Meron were one and the same place. As the last important event in Simeon's life it is recorded that, accompanied by Eleazar b. Jose, he was sent to Rome with a petition to the emperor for the abolition of the decree against the three main observances of the Jewish religion, and that his mission was successful (Me'i. 17b). The reason Simeon was chosen for this mission is stated (ib.) to have been that he was known as a man in whose favor miracles often were wrought. At Rome, too, Simeon's success was due to a miracle, for while on the way he was met by the demon Ben Temalion, who offered his assistance. According to agreement, the demon entered into the emperor's daughter, and Simeon exorcised it when he arrived at the Roman court. The emperor then took Simeon into his treasure-house, leaving him to choose his own reward. Simeon found there the vexatious decree, which he took away and tore into pieces (comp. "Tefillot R. Shim'on b. Yoḥai" in Jellinek, "B. H." iv. 117 et seq., where, instead of "Ben Temalion," "Asmodeus" occurs). This legend, the origin of which apparently is non-Jewish, has been the subject of discussion bymodern scholars. Israel Lévi (in "R. E. J." viii. 200 et seq.) thinks it is a variation of the legend, found in the "Acta Apostolorum Apocrypha" (ed. Tischendorf, pp. 246 et seq. ), of the apostle Bartholomew exorcising a demon that had taken possession of the daughter of Polymnius, the King of India. Israel Lévi's opinion was approved by Joseph Halévy (in "R. E. J." x. 60 et seq.). Bacher (ib. xxxv. 285 et seq.) thinks there is another Christian legend which corresponds more closely to the Talmudic narrative, namely, that narrated by Simeon Metaphrastes in "Acta Sanctorum" (vol. ix., Oct. 22, 1896), according to which Abercius exorcised a demon from Lucilla, the daughter of Marcus Aurelius. Simeon is stated to have said that whatever might be the number of persons deserving to enter heaven he and his son were certainly of that number, so that if there were only two, these were himself and his son (Suk. 45b; Sanh. 97b; comp. Shab. 33b). He is also credited with saying that, united with his son and Jotham, King of Judah, he would be able to free the world from judgment (Suk. l.c. ; comp. Yer. Ber. ix. 13d and Gen. R. xxxv. 3 [where Simeon mentions Abraham and the prophet Ahijah of Shiloh, instead of his son and Jotham]). Thus, on account of his exceptional piety and continual study of the Law, Simeon was considered as one of those whose merit preserves the world, and therefore during his life the rainbow was never seen, that promise of God's forbearance not being needed (Yer. Ber. l.c.). 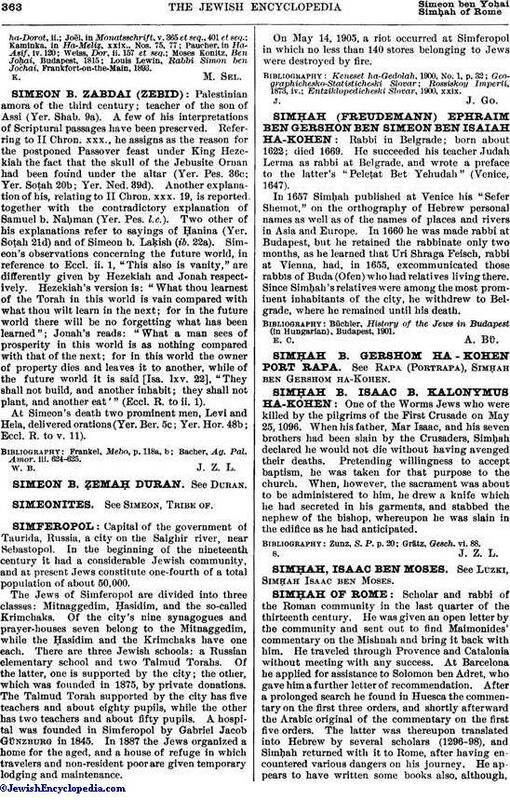 Simeon's halakot are very numerous; they are met with in all the treatises of the Talmud except Berakot, Ḥallah, Ta'anit, Nedarim, Tamid, and Middot. He greatly valued the teaching of his master Akiba, and he is reported to have recommended his pupils to follow his own system of interpretation ("middot") because it was derived from that of Akiba (Giṭ. 67a). But this itself shows that Simeon did not follow his teacher in every point; indeed, as is shown below, he often differed from Akiba, declaring his own interpretations to be the better (Sifre, Deut. 31; R. H. 18b). He was independent in his halakic decisions, and did not refrain from criticizing the tannaim of the preceding generations (comp. Tosef., Oh. iii. 8, xv. 11). He and Jose b. Ḥalafta were generally of the same opinion; but sometimes Simeon sided with Meïr (Kelim iii. 5; Me'i. 11a). 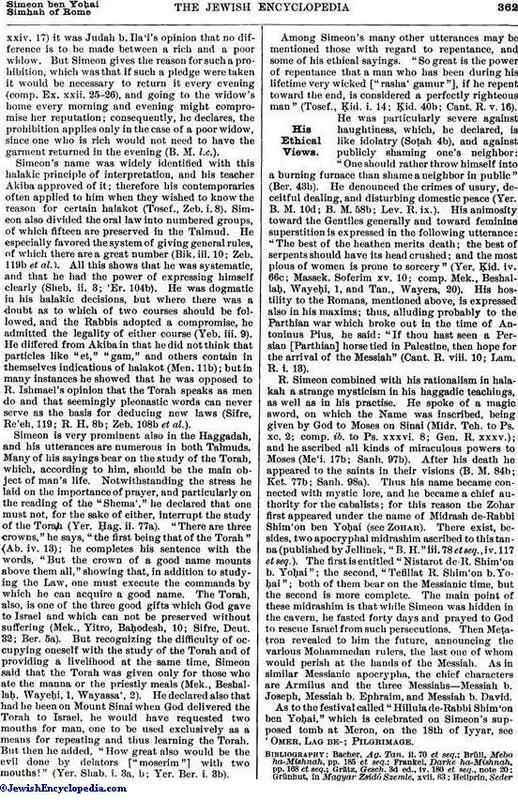 Like the other pupils of Akiba, who, wishing to perpetuate the latter's teaching, systematized it in the foundation of the Mishnah (R. Meïr), Tosefta (R. Nehemiah), and Sifra (R. Judah), Simeon is credited with the authorship of the Sifre (Sanh. 86a) and of the Mekilta de-Rabbi Shim'on, the former work being a halakic midrash to Numbers and Deuteronomy, the latter a similar midrash to Exodus. 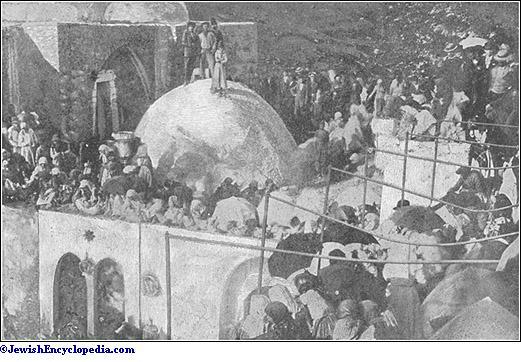 Traditional Tomb of Simeon ben Yoḥai During a Pilgrimage. The particular characteristic of Simeon's teaching was that whether in a halakah or in a haggadic interpretation of a Biblical command, he endeavored to find the underlying reason therefor (B. M. 115a et al.). This often resulted in a material modification of the command in question. From many instances the following may be taken: In the prohibition against taking a widow's raiment in pledge (Deut.xxiv. 17) it was Judah b. Ila'i's opinion that no difference is to be made between a rich and a poor widow. But Simeon gives the reason for such a prohibition, which was that if such a pledge were taken it would be necessary to return it every evening (comp. Ex. xxii. 25-26), and going to the widow's home every morning and evening might compromise her reputation; consequently, he declares, the prohibition applies only in the case of a poor widow, since one who is rich would not need to have the garment returned in the evening (B. M. l.c.). Simeon's name was widely identified with this halakic principle of interpretation, and his teacher Akiba approved of it; therefore his contemporaries often applied to him when they wished to know the reason for certain halakot (Tosef., Zeb. i. 8). 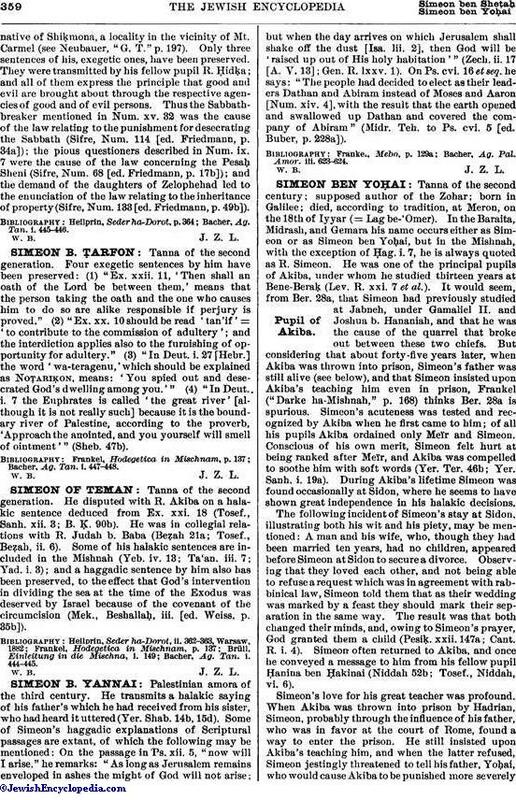 Simeon also divided the oral law into numbered groups, of which fifteen are preserved in the Talmud. He especially favored the system of giving general rules, of which there are a great number (Bik. iii. 10; Zeb. 119b et al.). All this shows that he was systematic, and that he had the power of expressing himself clearly (Sheb. ii. 3; 'Er. 104b). He was dogmatic in his halakic decisions, but where there was a doubt as to which of two courses should be followed, and the Rabbis adopted a compromise, he admitted the legality of either course (Yeb. iii. 9). He differed from Akiba in that he did not think that particles like "et," "gam," and others contain in themselves indications of halakot (Men. 11b); but in many instances he showed that he was opposed to R. Ishmael's opinion that the Torah speaks as men do and that seemingly pleonastic words can never serve as the basis for deducing new laws (Sifre, Re'eh, 119; R. H. 8b; Zeb. 108b et al.). Simeon is very prominent also in the Haggadah, and his utterances are numerous in both Talmuds. Many of his sayings bear on the study of the Torah, which, according to him, should be the main object of man's life. Notwithstanding the stress he laid on the importance of prayer, and particularly on the reading of the "Shema'," he declared that one must not, for the sake of either, interrupt the study of the Torah (Yer. Ḥag. ii. 77a). "There are three crowns," he says, "the first being that of the Torah" (Ab. iv. 13); he completes his sentence with the words, "But the crown of a good name mounts above them all," showing that, in addition to studying the Law, one must execute the commands by which he can acquire a good name. The Torah, also, is one of the three good gifts which God gave to Israel and which can not be preserved without suffering (Mek., Yitro, Baḥodesh, 10; Sifre, Deut. 32; Ber. 5a). But recognizing the difficulty of occupying oneself with the study of the Torah and of providing a livelihood at the same time, Simeon said that the Torah was given only for those who ate the manna or the priestly meals (Mek., Beshallaḥ, Wayeḥi, 1, Wayassa', 2). He declared also that had he been on Mount Sinai when God delivered the Torah to Israel, he would have requested two mouths for man, one to be used exclusively as a means for repeating and thus learning the Torah. But then he added, "How great also would be the evil done by delators ["moserim") with two mouths!" (Yer. Shab. i. 3a, b; Yer. Ber. i. 3b). Among Simeon's many other utterances may be mentioned those with regard to repentance, and some of his ethical sayings. "So great is the power of repentance that a man who has been during his lifetime very wicked ["rasha' gamur"], if he repent toward the end, is considered a perfectly righteous man" (Tosef., Ḳid. i. 14; Ḳid. 40b; Cant. R. v. 16). He was particularly severe against haughtiness, which, he declared, is like idolatry (Soṭah 4b), and against publicly shaming one's neighbor: "One should rather throw himself into a burning furnace than shame a neighbor in public" (Ber. 43b). He denounced the crimes of usury, deceitful dealing, and disturbing domestic peace (Yer. B. M. 10d; B. M. 58b; Lev. R. ix.). His animosity toward the Gentiles generally and toward feminine superstition is expressed in the following utterance: "The best of the heathen merits death; the best of serpents should have its head crushed; and the most pious of women is prone to sorcery" (Yer. Ḳid. iv. 66c; Massek. Soferim xv. 10; comp. Mek., Beshallaḥ, Wayeḥi, 1, and Tan., Wayera, 20). His hostility to the Romans, mentioned above, is expressed also in his maxims; thus, alluding probably to the Parthian war which broke out in the time of Antoninus Pius, he said: "If thou hast seen a Persian [Parthian] horse tied in Palestine, then hope for the arrival of the Messiah" (Cant. R. viii. 10; Lam. R. i. 13). R. Simeon combined with his rationalism in halakah a strange mysticism in his haggadic teachings, as well as in his practise. He spoke of a magic sword, on which the Name was inscribed, being given by God to Moses on Sinai (Midr. Teh. to Ps. xc. 2; comp. ib. to Ps. xxxvi. 8; Gen. R. xxxv. ); and he ascribed all kinds of miraculous powers to Moses (Me'i. 17b; Sanh. 97b). After his death he appeared to the saints in their visions (B. M. 84b; Ket. 77b; Sanh. 98a). Thus his name became connected with mystic lore, and he became a chief authority for the cabalists; for this reason the Zohar first appeared under the name of Midrash de-Rabbi Shim'on ben Yoḥai (see Zohar). There exist, besides, two apocryphal midrashim ascribed to this tanna (published by Jellinek, "B. H." iii. 78 et seq., iv. 117 et seq.). The first is entitled "Nistarot de-R. Shim'on b. Yoḥai"; the second, "Tefillat R. Shim'on b. Yoḥai"; both of them bear on the Messianic time, but the second is more complete. The main point of these midrashim is that while Simeon was hidden in the cavern, he fasted forty days and prayed to God to rescue Israel from such persecutions. Then Meṭaṭron revealed to him the future, announcing the various Mohammedan rulers, the last one of whom would perish at the hands of the Messiah. As in similar Messianic apocrypha, the chief characters are Armilus and the three Messiahs—Messiah b. Joseph, Messiah b. Ephraim, and Messiah b. David. As to the festival called "Hillula de-Rabbi Shim'on ben Yoḥai," which is celebrated on Simeon's supposed tomb at Meron, on the 18th of Iyyar, see 'Omer, Lag be-; Pilgrimage. Louis Lewin, Rabbi Simon ben Jochai, Frankfort-on-the-Main, 1893.